Brussels (VNA) – Vietnam’s potential and advantages in investment and trade once the EU-Vietnam Free Trade Agreement (EVFTA) and the EU-Vietnam Investment Protection Agreement (EVIPA) take effect were introduced at the ASEAN Trade and Investment Forum in Brussels, Belgium, on April 4. Speaking at the forum, Nguyen Canh Cuong, Minister Counsellor and head of the Vietnam Trade Office in Belgium and the EU, briefed on Vietnam’s import-export with the EU in general and Belgium in particular as well as the country’s major competitive advantages. Vietnam considers the EU one of its top partners, he said, adding that when the EVFTA and EVIPA are signed and ratified in the near future, investors in the Vietnamese market, particularly those operate in the IT and green industries and at manufacturing-processing industrial parks, will be offered investment and tax incentives. Once the EVFTA goes into effect, the EU will eliminate import duties on approximately 85.6 percent of its tariffs lines on Vietnamese products. After seven years, 99 percent of EU tariffs will be removed for Vietnamese products. Vietnamese textiles, footwear, and seafood products (except for canned tuna and fish balls) will incur no import duties within seven years after the agreement takes effect. Vietnam will eliminate 65 percent of its import duties on EU items and has drawn up a roadmap to eliminate tariffs by over 99 percent over the next decade. The remaining export items will be offered tariff quotas with an import duty of zero percent. 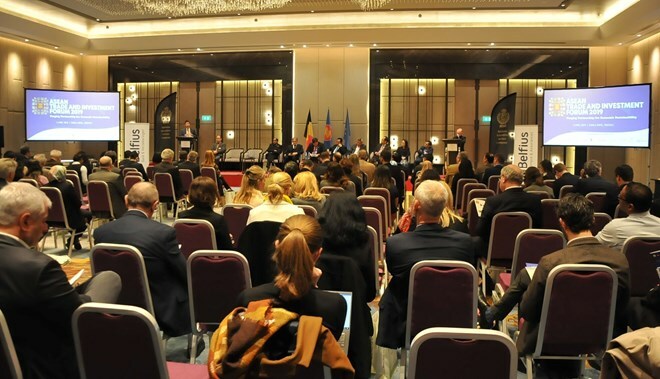 The forum was organised by the ASEAN-Brussels Committee, bringing together almost 200 representatives from leading Belgian and EU companies. The Association of Southeast Asian Nations (ASEAN) comprises Brunei, Cambodia, Indonesia, Laos, Malaysia, Myanmar, the Philippines, Thailand, Singapore and Vietnam.